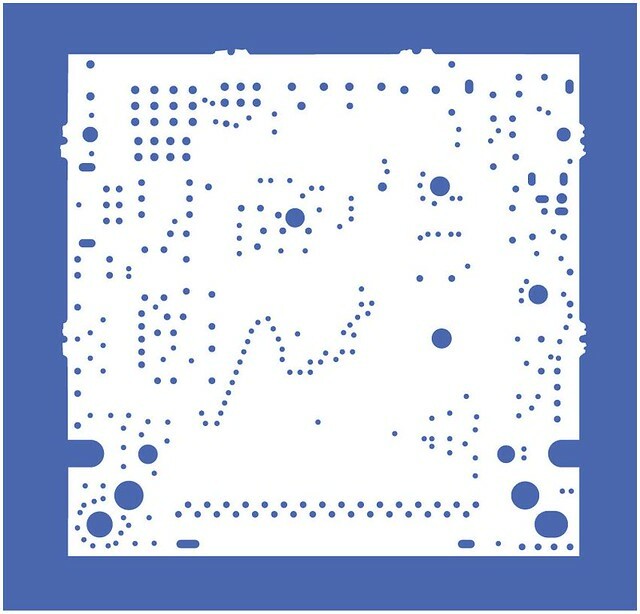 I made the first Circuit Portrait in 2013. It was a self-portrait, featuring my own Polarshield design. The second Circuit Portrait was a circuit that was very familiar to me: Arduino Uno. There’s some pictures of it on the original listing on Etsy, or inevitably, on pinterest. Quite unlike all of the Circuit Portraits that have come since, the Arduino Uno is already a recognisable circuitboard. There’s no case or wrapping, so even in it’s most abstracted artwork form, it’s still quite distinctive. 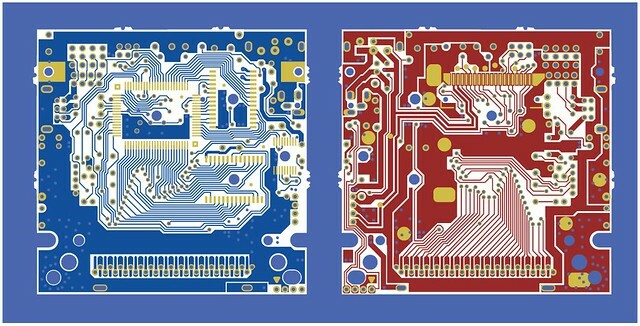 I printed this with an extra background layer to give it a bit more definition, so this is a four-layer print: Background (grey), bottom copper (blue), top copper (red) and pads and vias (yellow). The print itself is more detailed than the first edition, so though it is the same “portrait”, the treatment and result is quite different. As the first edition, this was taken directly from the source files, rather than being copied from a real board. First, buy an old Gameboy. I found there were lots of old iterations, and it wasn’t as easy as I thought to find one that was of the first generation. One ebay later, I broke open a dirty yellowed case and was surprised to find a lot of hardware inside. I suppose I was just expecting an integrated chip on a high-density board. 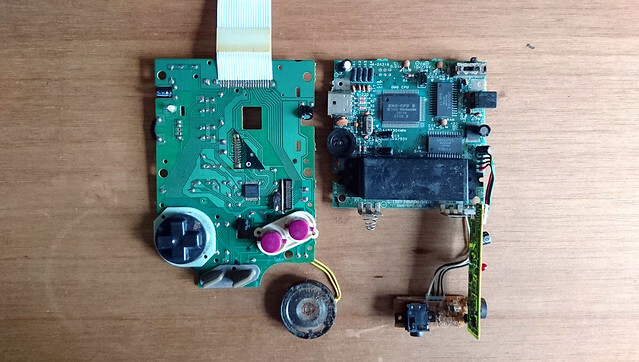 There’s four boards in total, one has the controls and the connection for the screen (DMGLCD on the left – the ribbon that connects to the screen is snipped off already in this pic). There’s a little loudspeaker attached too. It’s pretty much single-sided. 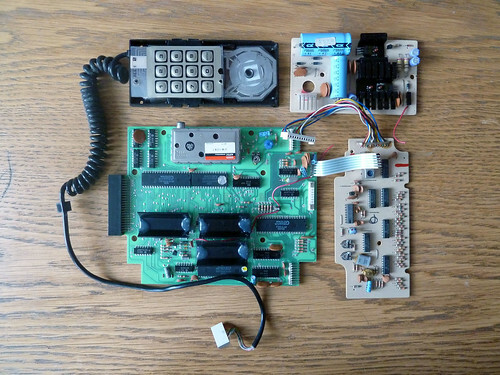 The other main board (DMGCPU) has got the processor and memory on it, along with the socket for the carts (the black rectangular thing on the right-hand board), the battery connectors, the multitap connector and a couple of other switches and dials. 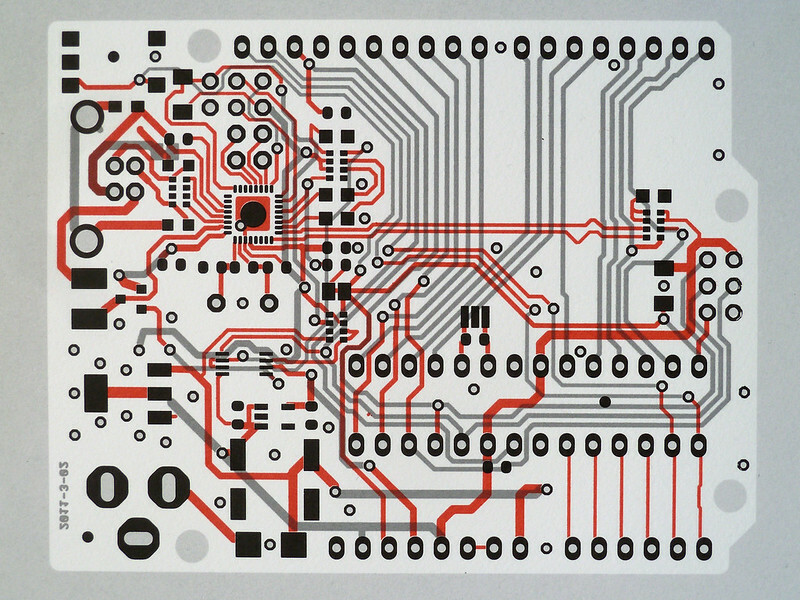 This is a double-sided board, with components on both sides. The other two boards are a power supply and a headphone output. To strip the boards, I bake them for a couple of minutes in the oven, then pull them out and bash them upside down until the components fall off. Some of the components will melt, burn, or explode (electrolytic caps for instance) if they go in the oven, so I snip them off beforehand, and make sure the leftover wires get shaken out. Most of the solder comes off with a good shake too, but I use a soldering iron to clean up, and smooth down any sharp points. Give them a good scrub and wash with soap and water, and they’re ready for scanning. Scan, and faff on with the image to get good contrast, align both sides into a stack and correct any distortions that have crept in. Import the bitmaps into a vector drawing tool, and start tracing. It’s possible to autotrace this kind of thing, but I’ve never found it to be accurate enough to get across the consistency and sharpness of the real thing. Overall you get a good impression, especially at a distance, but it’s not the same close up. The main reason for laying out the circuits by hand is to do with the heritage and origin of the Circuit Portraits project. This is a project about the designers of the boards, rather than the boards themselves. By applying the concentration that’s needed to lay out these traces one by one, I’m paying tribute to the effort that the original engineer put into it. It’s not the same of course – the original engineer had to design the circuit at the same time as lay it out, had to work within the constraints of the component positions, as well be aware of all the design rules around the electrical circuit, radio frequency interference, manufacturability and robustness. I just copy what I see. It’s not the same, but mechanically, the physical action is the same. 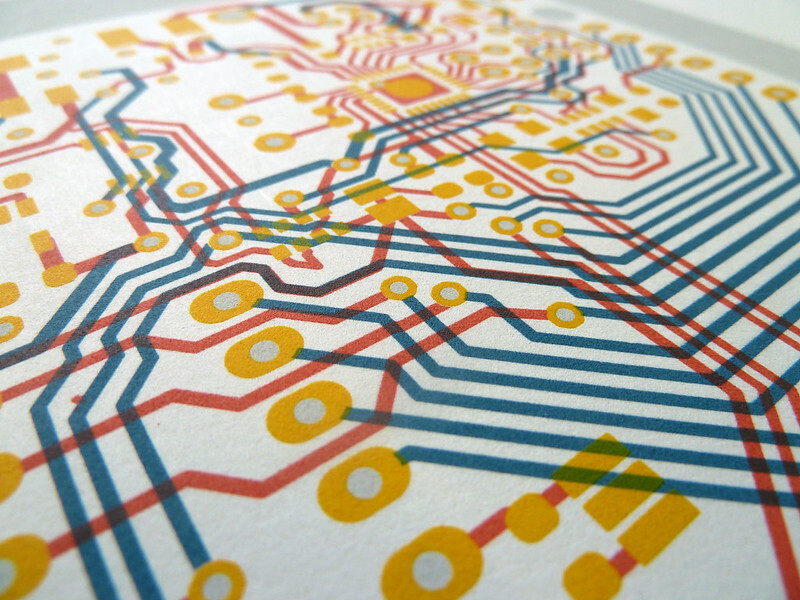 Which are the areas actually printed in copper onto the circuitboards. These shapes are a mixture of signal traces and “pour” areas. Those are large, low-resistance areas, usually ground planes. 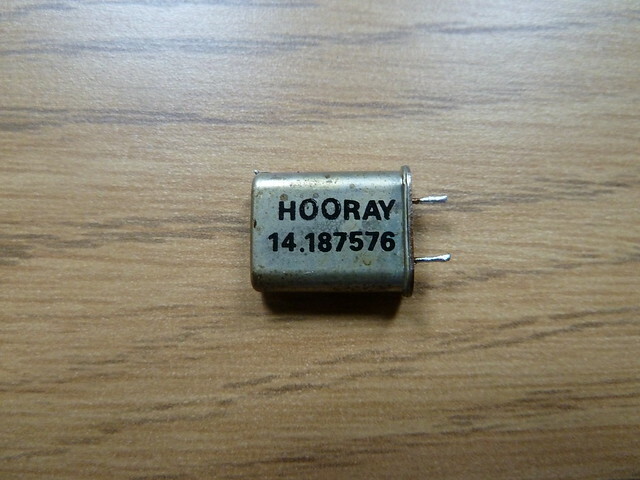 On the board, these are usually covered with a green solder mask. The other features are exposed pads, which are tinned areas of copper that is not covered by the solder mask. These are areas that components are soldered to. 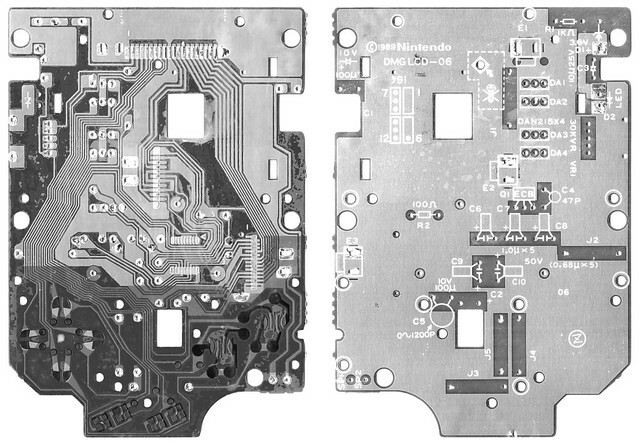 In the Gameboy there’s two kinds of components: Through-hole and surface-mount. Through-hole components have wires sticking out of them, that go through holes in the boards, and then the holes get filled with solder. The row of holes at the bottom of the board above is for through-hole components, specifically it’s for the socket for the gamepaks. Through-hole is often used for connectors because it tends to be stronger. The sets of rectangular pads on the board are where surface-mount components are fixed – the CPU and the memory chips are surface-mount. They are just fastened down with tiny blobs of solder on each of the legs of the component. 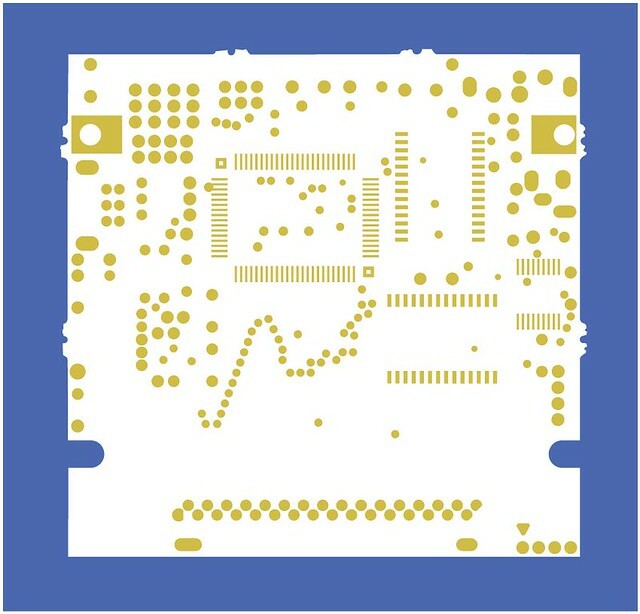 The two rectangular pads in the top-left and top-right of the board are exposed pads, but they aren’t for any soldering. They’re usually left like that for some kind of mechanical conduction – there’s a screw through the holes, and they’ll couple the ground plane to the chassis or some shielding. Last feature (which I normally trace out first) is the holes and vias. 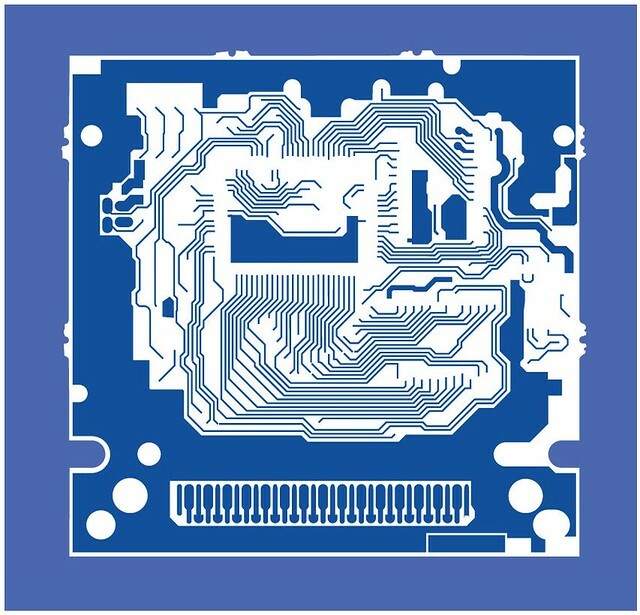 Some holes are for components to go through, but many are vias – this is a hole through the board that is filled with copper or solder, and carries a signal from one side of the board to the other. There’s a wavy line of these right in the middle of this board, that carry the signal on that buss through to the other side – where they’re actually routed to the gamepak socket. So that’s the artwork copied. The boards can finally be retired – they have served humankind well. Now I’ve got some composition to do. Some boards look great with their layers stacked – others look like a mess. I didn’t like the way the DMG boards looked stacked, so decided to make a more simple print showing only one side of each of the two main boards. There’s some interpretation here, and that’s part of the project too: re-presenting these engineering artefacts as aesthetic evocations. I tried lots of different layouts and mixtures, and settled on a pattern that showed both boards, along with the the pattern of pads that hold the ribbon cable that links the two boards. Importantly, the controls (buttons and D-pad) are obvious. I get each layer (copper / pads / holes) printed onto film by squeegeeandink.com, and then expose those film positives against a silkscreen that’s coated in a light-sensitive emulsion. Wash the screen out, and what’s left behind is a stencil. After that it’s screen printing as usual. 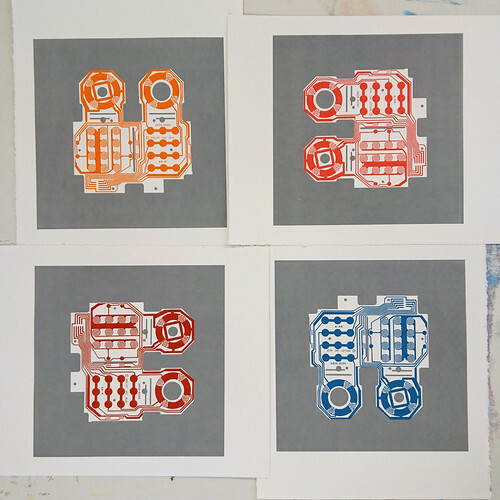 I print myself, manually in the printshop in the basement of the building where my studio is. I finally got time to get into the printshop this week to get printing again. My target was the coveted “Issue One” circuit board for the Sinclair ZX Spectrum. This was the original layout as put together by Richard Altwasser in 1982. I’d finally tracked down a donor board in April last year, stripped it and started tracing it, but other work overtook me and I hadn’t been able to get into the studio to print until after Hogmanay. It looks rather like the ZX81 (a simpler Altwasser design from the previous year), but is bigger, and has many more parts on it. I really like these free-hand style boards, and they’re very unusual for this generation of machine. (Subsequent issues of this computer used a more recognisable orthogonal, angular pattern.) I also had a devil of a time tracking down a ZX Spectrum Issue One that hadn’t been lovingly restored (and cost hundreds of pounds), or was a “rare” item. This was the most expensive donor, by far. The necessity to destroy the containing object (the computer) has been a significant feature in this series of artworks. Physically stripping away the context around the board, the case, components, markings and labels, to reveal the signs of the human creator inside. I’ve printed a set of these in what I consider the “signature” circuit portrait colour scheme, and then a handful of assorted other combinations. Once again, I’m using Somerset Satin paper and four layers of acrylic ink. The paper is roughly A3 with four torn or deckled edges, the printed area is roughly A4. Check the shop (http://circuitportraits.bigcartel.com/) if you’ve got a hankering for one of these fine pieces of computing history. Mattel brought out this behemoth in 1980, the very first generation of games consoles, competing with the the Atari VCS. Inside the huge brown and gold case are three separate circuitboards (one double-sided, two single), and each controller has a fairly neat flexi-board, printed onto acetate sheets and folded in half to create the contacts. I struggle to believe these contacts in the controllers were very reliable. 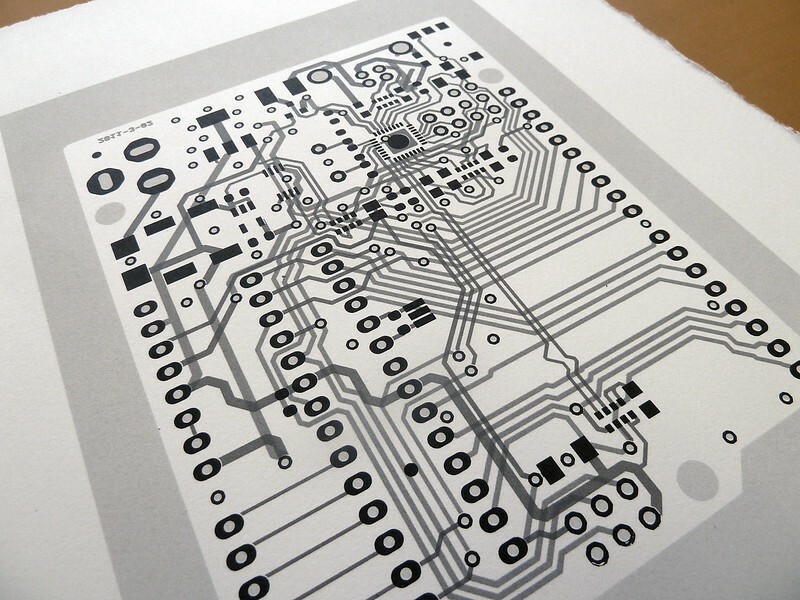 The Commodore 64 has a huge circuitboard in it, and I decided to print it even bigger – so this new addition to the Circuit Portrait project is a 50x70cm revelation of this famous machine’s inner beauty. The prints available are a small run of this cabbage and sky pattern, and a handful of other random colour combinations that I’ll try to get photographed. This big print is going to be the centrepiece of my contribution to Collidoscope, an exhibition curated by Alex Gunn that will be running from the 12th of December until Christmas. Please come along if you are in Edinburgh! This will be – unofficially – the launch of the Circuit Portrait project too. The C64 print was the flagship I was waiting for! The Sega Megadrive was the console we had at home in the 90s. I understand some folks call this machine a Genesis. I spent years playing Streets of Rage and Road Rash with my brother. 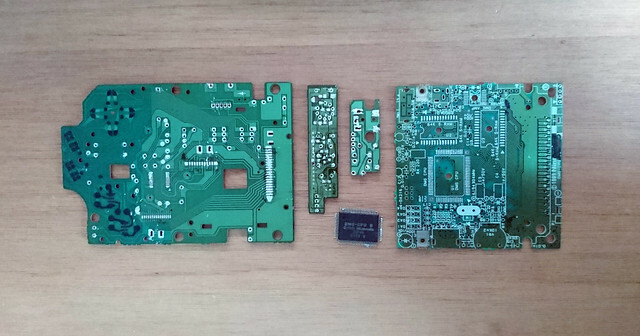 Breaking open a recent donation Megadrive, I wasn’t surprised to find a pretty dull, plain mainboard. This machine is a 16-bit device, based on a small number of integrated ICs, rather than lots of discrete parts like the older devices. So the routing is a bit ordinary, mostly stringing a couple of big square chips together with a swathe of parallel traces. It’s quite a modern looking board, and modern boards tend towards the dull, even ones with great emotional heritage. However, the picture above is of new prints of two tiny supporting PCBs that hold the power jack and the headphone sockets on the Megadrive. They were connected to the mainboard with ribbon cables. I’m printing these small, postcard sized. Registration is pretty hit-and-miss for me, and with four layers there’s four chances to make a mess of it. I was taught to register the paper using little blocks at the edges, but I found the torn edges of the paper a bit too variable, so got some of these little steel registration pins made by Ternes-Burton in Minnesota, USA, and a pack of tabs. Mount the first screen in the press. Tape some tabs to the back of the first sheet of paper, and put the steel pins in the tabs. The tabs are mylar, and a tight, friction fit, so they hold the pins at any given position. Position the paper, with it’s tabs and pins on the print bed. The exact position of this first layer isn’t that critical, so I can easily eyeball it through the screen. Tape the pins down in place. For each subsequent sheet, place two tabs on the pins, with pieces of tape sticky-side up, then lay the new sheet onto them, using the first sheet as a position guide. Again, the exact positioning here isn’t critical. Take the sheet off the pins carefully and stack ready for use. Pull the first layer, being careful to not squeegee over the pins themselves. It won’t damage the screen right away, but it’ll wear, and make a bump if nothing else. For the next layer, Take the pins off the print bed, and fit them into the tabs on the first sheet of paper. Make a registration print onto a sheet of clear PVC, stuck to the print bed with a tape hinge at one side. Carefully position the paper so it is lined up with the image on the PVC, and tape the pins down firmly. Do subsequent layers the same way. This image shows that my registration still is far from perfect, but that is because of the PVC lineup stage, and an absence of trapping. What isn’t clear from this one picture is that all prints from this run are pretty identical – the same mis-registration on each one. Previous runs have been so variable, just attempting to line up using blocks for the torn edges of the page, so this is genuine progress. 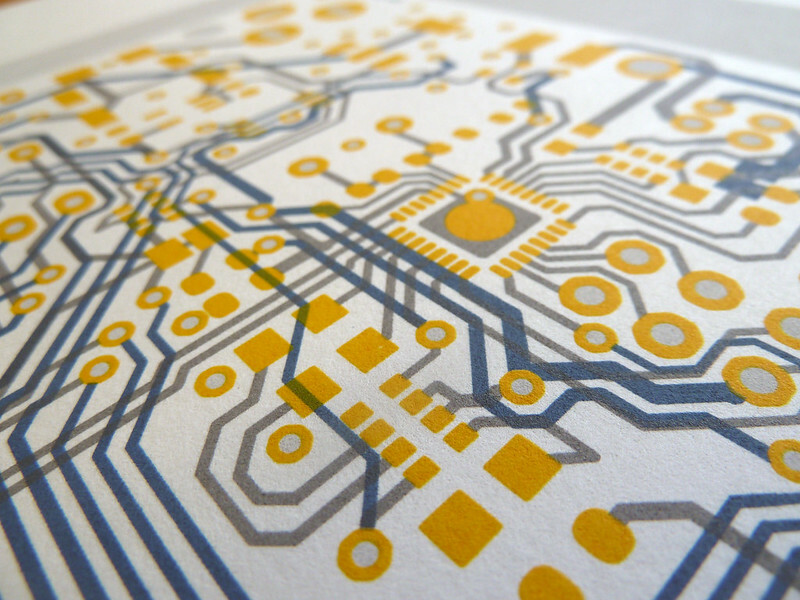 Circuit Portraits is a new printing, flat-shapes-on-paper project. It is run by Sandy Noble, and is a sibling of Polargraph and offspring of Up To Much, and will be publishing Art on paper. Currently failing at being in stealth mode, because the creator is too impatient, and the first examples from the initial series are drifting out. You’ve seen them on the Up To Much blog, and on Flickr, and you’ll be seeing a lot more of them right here. Buy one from the Circuit Portraits webshop.